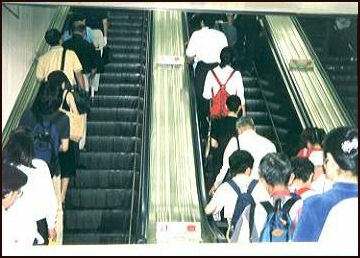 Leaving space for others on an escalator Japan has been described as the world's most polite society. In situations that involve two people with opposing interests, Japanese tend to put emphasis on the interest of the other person, while often Americans and Westerners emphasize their own interests. Even the scariest-looking, mohawked punks in Japan apologize profusely if they accidentally bump into you on the street. The origins of Japanese politeness is rooted in Shinto respect for nature, Confucian codes of conduct and Japanese rules for a stable society. During the Edo period, a caste-system-like set of rules was developed that regulated all aspects of people's lives and was defined by social-economic level and occupation. As a result people became obedient and passive and used to having their lives defined by rules. Going hand and hand with Japanese ideas about politeness are ideas about trust and promises. Kimiko Manes, author of Culture Shock in Mind, wrote in the Daily Yomiuri: “Samurai were expected to be holders of a “pure mind”and held the idea of “trust”in high regard.. An action was promised to another was carried out even if it was life-threatening...During the Edo period....with the rise of commerce, the merchant class adapted a similar ethical stance. Merchants of the era put their lives at stake so that debts could be repaid and promises carried out. Merchants who could not follow through would be shunned and could not survive, the idea of trust became exceedingly important.” When Japanese say something and make a promise it is considered etched in stone. Sometimes when I discuss a matter with my Japanese wife casual suggestions are treated like they are definite promises. The Japanese probably say "thank you," “excuse me”and “I’m sorry”more than any people. Not only do they offer thanks for all kinds of situations they also say thanks many times in regard to one thing. Japanese are also constantly saying things like the equivalent of “thanks so much for your effort”for doing mundane things like offering them a tissue or “it was a feast”when you give them some tea and cookies. The goal is maintaining social harmony by ensuring recognition and appreciation for good deeds. The custom of gift giving also rooted in this desire. The study “Apologies: Toward Communicative Competence”---published in The Bulletin of Nihon Fukushi Daigaku, Nihon Fukushi Universityin 1998 by F. Nonoyama---focuses on politeness rules in Japanese as applied to persons of a higher social position, persons with power, older persons, to men if a woman, in formal settings, and to someone with whom you do not have a close relationship. Nonoyama generalizes that older Japanese and those who have not lived in the U.S. tend to transfer their own sociocultural rules when they apologize in English. A study was conducted with 70 native English speakers in the US and 234 Japanese speakers, 70 responding in Japanese and 164 in English. Age, gender, position of power, and social distance were varied in four versions of a questionnaire. The research appears to find that his Japanese respondents do not make excuses to a person with higher status, yet the findings here ran counter to that. On bumping into a female, the native English speakers (E1) expressed an apology, while both the Japanese speakers (J1) and the Japanese using English (E2) did not, but rather confirmed damage ("Are you OK?" "Are you hurt?") Not a gender difference here -- females likely to express an apology (89 percent) than males (52 percent). So E2 was more like J1 than E1. An exception: a difficult job to do, J1 utilized expression of apology, while E2 hedged as did Asia . The paper Kansha to wabino teishiki hyougen: Bogowashano shiyou jitttaino cyousa karano bunseki [A study of Japanese formulaic thanks and apologies: A data analysis of the use by Japanese native speakers]. Nihongo Kyouiku [Journal of Japanese Language Teaching] (1995 by H. Ogawa investigates formulaic expressions of gratitude, which includes not only the variants of arigatou but also those that can also convey apology (such as sumimasen).” Utilizing a questionnaire containing 19 thanking and 9 apologizing situations, this study surveyed native speakers in their 20's to 80's to reveal their usage of formulaic expressions of thanks and apology.” The informants were 221 females and 51 males of similar educational backgrounds who spoke the standard variety of Japanese.” The variables manipulated in the survey were high/low status, in-group/out-group, and closeness/distance.” The findings suggest that the use of sumimasen is not suitable for all thanking situations.” Whereas in this study the younger generation of speakers used sumimasen to express slight thanks or apology to someone older and/or in out-group (soto such as strangers), the older generation used it to friends or those younger than themselves.” Younger speakers used more formal apology expressions (such as moushiwake arimasen) with someone older (and higher in status) for a major infraction, since sumimasen was used to express relatively slight thanks and minor apology. The paper “Requestive hints in Japanese and English”---published in the Journal of Pragmatics in 1999 by C. Rinnert and H. Kobayashi---is an analysis of elicited questionnaire judgments and naturally occurring data on Japanese and English requests revealed an apparent contradiction between the perception of decontextualized hints (except for the very formal Japanese hints) as relatively impolite and the high frequency of actual use of hints in a university office setting. It was found that Japanese hints are generally more opaque than English hints. There is a trade off between pragmatic clarity on the one hand and avoiding coerciveness on the other. The researchers found that "off-record" requestive hints may differ from "on-record" hint-like request formulations. They concluded that the use of requestive hint formulations builds solidarity in different ways in the two cultures. The researchers used a questionnaire with 10 English requests varying in terms of formality levels and degree of directness. The authors describe in detail how they presented the Japanese request material. The sample consisted of 145 Japanese subjects (92 university students, 14 teachers, and 30 university office workers or older students) and 95 native English-speaking subjects (40 teachers mainly from North America teaching in Japan and 55 U students in the US). Naturally occurring requestive hints were also collected in Japanese (n=78) and in English (n=67). Here the finding was that Japanese hints generally tended to be more opaque than English hints, particularly in terms of the illocutionary scale. In office situations in Japan where a person of higher status could risk losing face if a person of a lower status reject their request, the use of highly indirect requests (i.e., requestive hints) functions to avoid coerciveness more than the use of conventionally indirect requests. Information-seeking questions give the speaker the possibility of denying it was a request (e.g., "Are there any batteries?"). Also in Japanese they found utterances with the component (reference to some component of the requested act) + zero illocutionary force (no statement of illocutionary intent), (e.g., o-bento 'box lunch' used as a request to order a box lunch). There is no need to request it because it is understood from context. Saying more would create a negative impression of verbosity, directness, or aggressiveness. Such preference for implicitness could account for the high level of ellipsis in the Japanese data they collected. In the English data, the component (reference to some component of the requested act) + a grounder (giving a reason why the request is necessary) was most frequently employed (e.g., If she comes around I need to talk to her). This can be interpreted as solidarity building between the speaker where the speaker does not impose the request on the hearer. In the paper “Irai hyougenno taisyou kenkyuu: Eigono irai hyougen [Contrastive anlysis of requests: English and Japanese requests]”---published in Nihongogaku in 1995 M. Sasaki---says Japanese tend to adjust their language based on status of the interlocutors and claims that in Japanese, requests are often considered to be difficult to refuse. The hearer normally attempts to avoid refusing, and the speaker uses negative politeness to minimize the imposition. Sasaki argues that in English it is easier to refuse to comply with a request. In the article “Kotowari” no houryaku: Taijin kankei chouseito komunikeishon (Strategies of refusals: Interpersonal adjustments and communication)”---published in Gengo [Language] in 1990---T. Moriyama analyzes the speech act of refusals in terms of benefits and imposition, strategies, and reasons behind using particular strategies. The author administered a questionnaire to 51 male and 40 female Japanese college students, eliciting the refusal strategies that they would use in one refusal situation. The refusal strategies fell into four categories: 1) direct refusal, 2) telling a white lie, saying tsugouga tsukanai “I have a prior engagement that cannot be changed,” 3) postponing response, saying kangaete oku “I’ ll think about it,” and 4) making an indefinite response by smiling. The response strategies were also analyzed in terms of closeness, social status, age, and gender of the interlocutors. The direct refusal (Type 1 above) was found to be often directed to close friends (approximately 70 percent) as the respondents probably perceived no need to conceal true feelings in such a relationship. Telling a white lie (Type 2 above) was perhaps used in consideration for the hearer, behaving as if the hearer’s intentions were more important than the speaker’s or as if the refusal was beyond the speaker’s control. The postponement (Type 3) by a close friend was interpreted as cause for hope by 60 percent of the participants while only about 30 percent did so if uttered by someone not very close. The postponing strategy was seldom used with someone of higher status, since it presupposed the importance of the speaker’s intention rather than the hearer’s. With regard to the second refusal in response to the friend’s repeated request, males were likely to make a direct refusal while females tended to tell a white lie. In a 1992 article in the Bulletin of the English Literature Department, Teikyo University, Tokyo, K. Yanagiya, raises the question of whether routine (not "heartfelt") apologies really express regret. When might they be considered insincere, infelicitous? Or are they not apologies at all but simply share the forms? This is considered exacerbated with Japanese where apologies are not so much an expression of regret as an expression of sumanasa, mooshiwakenasa and oime -- the feelings of inexcusableness and indebtedness. Her point is that speech acts are not clear-cut entities but rather overlap or fade into each other. The features of the core, prototypical cases may be said to be universal. Even though it may seem like dominance, social distance, and severity of offense are universal in defining the character of a situation, the formality of the occasion in Japanese may change the forms of the utterances even when other factors are kept constant. The author also points out that in Japanese apologies are frequently nonverbal -- just hanging down one's head without saying a word, possibly with tears in the eyes. Moreover, 49 percent of the Japanese students considered an apology a "very important" part of the resolution process compared to 18 percent of the Americans. Other response options bore out the notion that apologies were much more vital for the Japanese respondents. Fifty-six percent of the American students said an apology would be "nice, but would not change their feelings," compared to 37 percent of the Japanese. Sixteen percent of the American students said an apology was "not necessary" as opposed to 3 percent of their Japanese counterparts. Apologies cannot rectify all damages, but they undoubtedly serve an important function, perhaps more so in Japan than in the United States. When in doubt, sorry on! “Sorry for your kindness': Japanese interactional ritual in public discourse”---published in the Journal of Pragmatics in 1998 by R. Ide---examines the social and metapragmatic functions of sumimasen (lit., 'there is no end' or 'it is not enough'), a conventional expression of apology in Japanese that is also used to express the feeling of thanks. In the study he first describes seven pragmatic functions of sumimasen based on 51 instances of sumimasen recorded through ethnographic participant/non-participant observations of discourse in an ophthalmology clinic in Tokyo. The professionals were two female doctors, a female nurse, and a female receptionist. 58 patients participated, males and females of many ages. The seven functions: 1) sincere apology; 2) quasi-thanks and apology; 3) request marker; 4) attention-getter; 5) leave-taking devise; 6) affirmative and confirmational response; 7) reciprocal exchange of acknowledgment (as a ritualized formulas to facilitate public face-to-face communication). These seven functions are presented not as mutual exclusive but rather overlapping concepts, ranging from remedial, remedial and supportive, to supportive in discourse. The article “Oreito owabi: Kankei syufukuno sisutemu toshite [Gratutude and apologies: A system of repair]”---published in Kokubungaku: Kaishakuto kyouzaino kenkyu [Department of Education: Interpretation and Material development] (1999) by T. Moriyama is an essay on gratitude and apology expressions in Japanese as a repair strategy in interpersonal communication. The motive for both gratitude and apologies is caused by a psychological imbalance (or a sense of indebtedness) between the speaker and the hearer. Expressions of gratitude and apologies both attempt to adjust that imbalance. An expression of gratitude repairs the sense of imbalance accompanied by a certain benefit on the part of the speaker offered by the hearer. Apologies also repair the offense caused by the speaker. Many apanese complain that good manner are on the way out. They point to people who talk loudly on cell phones and neck in subway cars; drivers who park where they want, even on sidewalks; pedestrians who don’t watch where they are going; and smokers who light up whoever they feel like. Teachers complain children refuse to sit still, listen or stop talking; coming-of-age ceremonies feature drunk young people who heckle speakers giving speeches; and lawmakers who throw water in the face of other lawmakers. Ttrain and airline companies have reported an increase of aggressive and inappropriate behavior. In a survey on bad manners, 60 percent of the respondents pointed their finger at middle school students and high school students as being poorly behaved; 55 percent blamed young women; and 51 percent blamed young men. Many old people find the younger generation to have such bad manners they call them "space aliens." In a study in 2003, 90 percent of Japanese said they felt that manners were declining. Ask what kind of things bothered them the most 68 percent of respondents said the improper disposal of cigarette butts and litter, 58 percent said noisy children who were not disciplined by their parents; 43 percent said the use of cell of phones on trains, 40 percent said pet owners who don’t clean the feces of their dogs; and 37 percent said people who improperly or illegally parked their cars or bicycles. In an international survey conducted in 2006 and 2007 Japan ranked second lowest of 18 countries among people who said it was important to help one another. In a psychological test conducted by Yoshimasa Nakazato at Toyo University students were judged on the basis of how many shared their winnings with losers after winning a game, In the mid-1980s, 80 percent of winning students gave away some of their chips to the losers. After the late 1980s the rate suddenly dropped to the 40 percent level. Makoto Kurozumi, a professor at Tokyo University who specialized in the history of Japanese thought, believes that compassion is in declining an importance as an aspect of the Japanese character as the traditional animist relationship with nature has broken down in today’s computerized and mechanized society. Novelist Toshiko Marks told the Daily Yomiuri: “Japan has reached unprecedented plenty without finding social norms as suitable for such wealth. The government has responded to the wave of bad manners by calling for a return of disciple to the classroom. Parents have responded by sending their children to charm school. The media has responding with ad campaign that shows a salaryman-insect displaying offensive behavior and the slogan "There is an increase in bugs disguised as humans." Train and subway companies have banned cell phone use and necking and instruct their employees on how to politely ask people to obey the rules. There have even been calls for a return of bushido, the code of the samurai.